Predation is a fact of life for most animals, whether they're monkeys, flying insects or ground squirrels. Dragonflies (Anisoptera) certainly aren't exempt from the woes of predation, with an assortment of common threats. Strangely enough, some of these big insects' predators aren't even animals; they're plants. 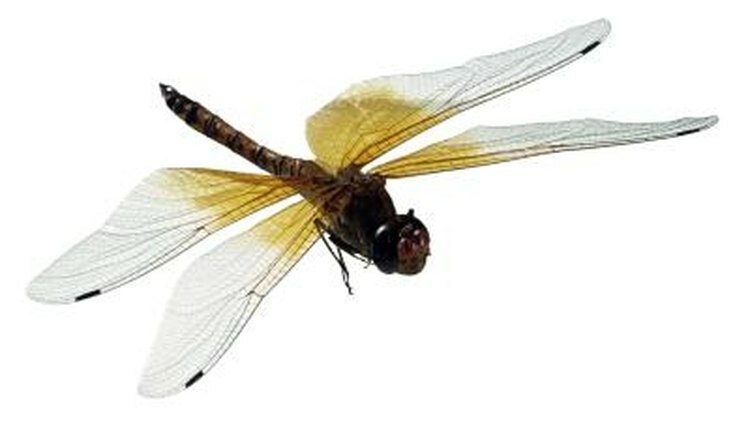 Juvenile and mature dragonflies have different sets of predators. In the aquatic larval stage, their primary predators are ducks, amphibians such as toads and newts, fish and bigger damselfly and dragonfly larvae. When the nymphs sense danger, they often attempt to dodge predation by pretending to be dead or by swimming away quickly. When predators clutch onto them, nymphs can escape by allowing their limbs to fall off. These limbs grow back during molting.The nymphs evade predation by hiding among plants as well. Adult dragonflies must dodge a broad assortment of predators, specifically arthropods, reptiles, fish such as bass, tiny mammals such as water shrews, frogs and fellow insects. Bees routinely go after mature dragonflies. When it comes to flying, dragonflies are highly agile creatures that can quickly flee danger, and birds are usually far too sluggish to catch them. Many types of dragonflies have skin that changes to look like their environments -- a means of staying under hungry predators' radars. A lot of actual "things" make dragonflies part of their diet, too. Sundew (Drosera) plants are small meat-eating organisms that seize invertebrates -- such as dragonflies -- and then promptly digest them to take in their nutrients. Insects provide sundew plants with vital nitrogen. The plants retrieve dragonflies with the help of their tentacles, which are equipped with glands that secrete a gooey substance that reliably secures insects when they make their way onto the surfaces of the plants' leaves. Working together, the tentacles and foliage then proceed to surround the trapped insects on all sides, initiating the digestion process. Dragonflies might be the prey, but they're also carnivorous predators. Dragonflies are pretty tough in the predation department, whether they're young or adult. Flies, damselflies, ants, termites, aphids and mosquitoes are all pretty common dishes on the mature dragonfly menu. Dragonflies frequently take their prey mid-flight. They're not overly picky about what they eat, and if they are capable of catching it, they'll probably eat it. The larvae are big on tadpoles, other larvae and bugs, and sometimes even enjoy small fish meals. What Are the Natural Enemies of Tree Frogs?